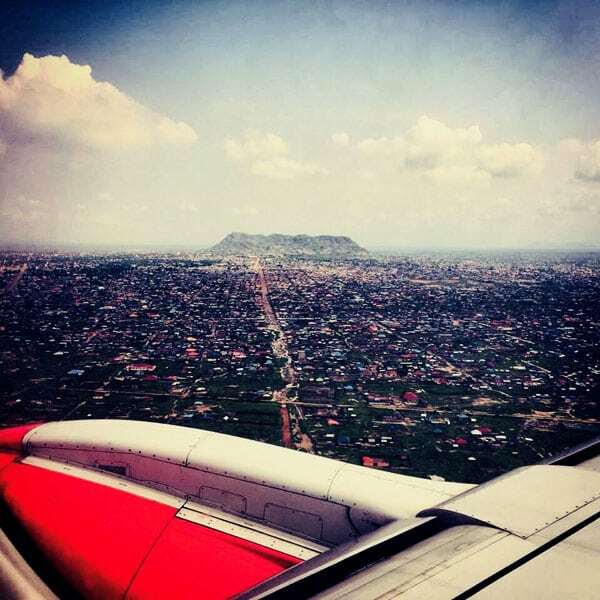 Sabrina, an Italian aid worker, took this photo as she landed in Juba, South Sudan for the first time. As part of our ongoing coverage about #MeToo among humanitarian aid workers, we interview Sabrina about what happened to her after she landed. After this podcast was first posted, we heard from the Terrain Hotel’s Paul Cockerill and Mike Woodward. We also heard from Terrain Hotel staff and others who survived the horrific incidents that occurred there in July 2016. Also, Sabrina and I discuss three women who were left behind for the night at the Terrain. Cockerill wishes to note that 40 people were left behind at the Terrain overnight, and were terrified, too. By asking about Sabrina’s experience and that of the three international aid workers only, some felt that I overlooked—or rendered invisible—the terror experienced by others. I also want to make clear that Sabrina was the first survivor of sexual assault to testify against her perpetrators in court. However, what I could have also made clear in the original podcast is that international staff flew from their homes in other African countries to Juba to testify against the alleged perpetrators for their roles in the assault of the Terrain Hotel compound itself, along with several South Sudanese witnesses. Those who were involved want me—and all of you—to know the incredible bravery it took for these witnesses to appear in court and they want desperately for me to honor their role in the trial. For more, please listen to the revised podcast. Sabrina agreed to speak to us in the wake of an historic verdict that came out of South Sudan last week, when a military court sentenced ten soldiers to jail terms ranging from seven years to life for their part in attacking the Terrain Hotel in Juba. The ambush occurred in July 2016 during heavy fighting between government and rebel forces. A journalist was killed, and five foreign aid workers were raped after dozens of troops stormed the hotel’s compound. Sabrina is one of the survivors and decided to return to South Sudan to testify against her perpetrators. For four years, Amy was the Africa Correspondent for PRI’s The World. She has also reported for NPR, PBS television, the BBC World Service, and The Guardian. Amy’s television investigation Sudan: The Quick and the Terrible was nominated for an Emmy Award. In 2011, she launched Tiny Spark, which investigates nonprofits, philanthropy and international aid. It was acquired by The Nonprofit Quarterly in 2018.